Russia is redistributing powers between federal and municipal authorities in the latest attempt to make regional government more effective. Some experts remain sceptical. A reform is under way in Russia that would allow regions to choose how to set up and elect their local government bodies and to reallocate powers between state and municipal authorities. In particular, there are four options for how local government bodies can be organized, and each region can select the option that suits it best. However, experts differ on how useful the proposed changes will be. Under the new local government reform, regions themselves have the right to choose out of the four options of system of local government. The first to introduce the relevant changes to their regional electoral legislation were the parliaments of the Volgograd and Moscow regions. The latter chose three options of forming local government bodies: the direct election of mayors who will head local administrations; the direct election of mayors who will also head local councils; the election of municipal heads from among local councilors. 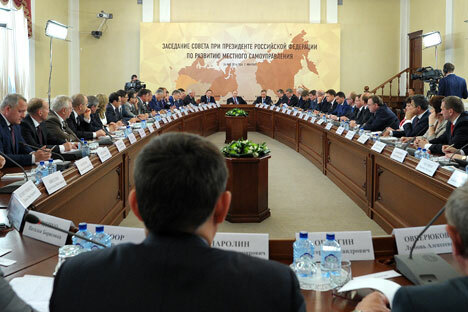 In the Volgograd Region, heads of municipal districts and municipalities will now be elected by local councils from among their members and will also serve as speakers of local councils. It is only heads of cities, towns and villages who will be elected by local residents, the Kommersant daily explains. Alexander Kynev, a political scientist and an expert in regional elections in Russia and the CIS, is convinced that this reform makes no sense apart from satisfying officials' desire to arrive at what they think will be a more manageable system. "As a result of these actions, the overall effectiveness of government will be reduced, which inevitably will affect local socio-economic development and population, which in turn will undermine the governors,” says Kynev. “Officials think that this system is better but it brings to mind a patient who is supervising an operation without having any knowledge of medicine." The Russian Federation has the following constituent parts: 22 republics, nine territories, 46 regions, three cities of federal standing (Moscow, St Petersburg, and Sevastopol), one autonomous region (the Jewish Autonomous Region), and four autonomous areas. Each region has a big city as its capital and is divided into districts. Each region has a governor, a regional parliament, heads of districts, municipal councilors and mayors in big cities. The masterminds of the reform say it will make it easier for people to put their demands across to the authorities but the expert thinks the opposite is true: "Previously, people elected the head of their municipality, now they don't. Now, even during an election campaign, people cannot come and say what they think to the future head of the local administration. Instead, a member of a local council at the lowest level will be elected, who has no powers whatsoever apart from the right to elect the next member." According to Kynev, these changes may seriously damage the popularity rating of those currently in power, as was the case when direct gubernatorial elections were abolished and people stopped taking any interest in politics because they thought they no longer had any power. A professor at the Higher School of Economics department of regional economy and economic geography, Alexei Skopin, agrees that a system whereby heads of districts are appointed rather than elected can reduce the level of democratic freedom, although he sees a positive side too in that governance will become more quick-footed and it will thus be possible to resolve more economic problems. "Russia has a difficulty with how powers are distributed between the federal, regional, and local levels,” the expert explains. “The problem is that at the federal level there is more money and less responsibility, whereas at the regional and local levels, there is more responsibility and less money. Attempts are being made to change this trend, to find a model whereby regional and local authorities will be able to survive without turning to the federal center." Skopin is convinced that the previous system made it possible to manipulate the regional authorities. "Say, the federal authorities are unhappy with a particular region, they allocate less money to it, local residents begin to protest and, as a result, the local governor is removed. In the end, regions become dependent on the federal center, which is not right. The problem is obvious but no one knows how to resolve it," he explains. According to Skopin, the reform will give municipalities powers to raise additional resources for development, so they can develop independently. "The problem is that local people are not active and changes like these should give the authorities at the lowest level an opportunity to come forward with initiatives either to the regional authorities or to investors," he concludes.